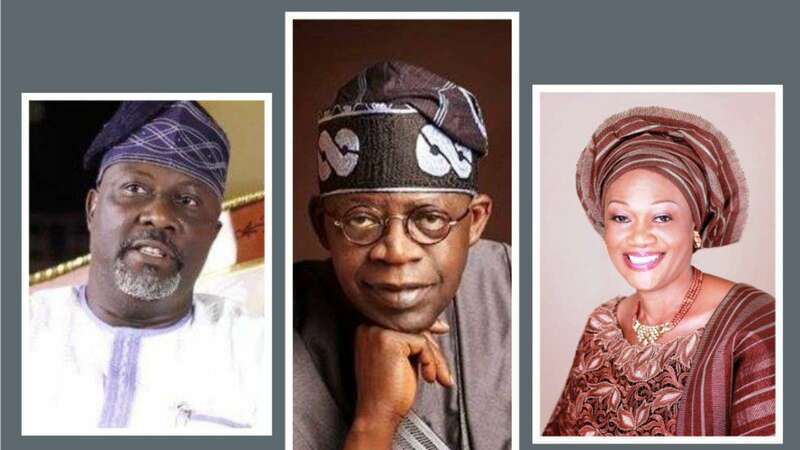 Senator Dino Melaye, yesterday, said he was provoked by Senator Oluremi Tinubu into a verbal altercation in the Senate’s closed-door session of on Tuesday and dismissed cautions from her husband, Asiwaju Bola Tinubu, saying he was neither God nor his political patron. In his reaction to news reports of his use of violent language and physical threats against Senator Tinubu, Melaye, at a press conference in the Senate Building, said most of the reports were exaggerated, even as he admitted using violent language upon her after she allegedly called him a dog and a thug. He said: “I have never been a coward; I will not start an apprenticeship programme now on how to become a coward. “Whatever I say anywhere, I can boldly repeat everywhere. When I stood up, and I made my submissions that day in the Senate, all I did was to pacify my colleagues and ask that the case in court be withdrawn because already, there is a resolution of the Senate that the rules of the Senate were not forged, and since there was a resolution of the Senate that the rules of the Senate were not forged, I said all those who have gone to court should go and withdraw their names from court and that if at the end of the day, they refused to withdraw their names from court, we should penalise them by suspending them. I said that. “But I did not use any insolent, abusive, degrading or mannerless language. So, there was no reaction from any of our colleagues as regards my presentation. “After I had spoken, many other senators spoke, and I did not mention the name of any senator while I was making my presentation. Unfortunately, Senator Oluremi Tinubu got up and was recognised to speak, and immediately she started speaking, she specifically mentioned my name, even when in my presentation I did not mention anybody’s name. “I only appealed to the sensitivity of my colleagues and asked them to withdraw their case from court and reminded them that there was a resolution of the Senate that the rules were not forged. But because of reasons only known to Senator Oluremi Tinubu, she got up, and the first thing she said was that she’s being harassed in this chamber by Senator Melaye. “I kept quiet at that point; she went ahead to say that why will she come here and be threatened by senators and there was a large chorus from senators saying ‘how, when, where’. “At that point, I was still very calm. She got up again and said that this thug must be tamed. At that point, I got up, and I told her that she is very stupid. “The next statement from her was that you are a dog. She called me a dog, and when she called me a dog, I stood up, and I reacted and told her that this is not Bourdillon and that she should look at my face, I am not one of those senators who normally come to prostrate to them in Bourdillon. “I told her I am from Kogi State, I am not from Lagos State and that there would never be a day I will come to you for political assistance. These were my words, and she went on shouting dog, thug. “I want to tell you, gentlemen of the press, that for every reaction, there must be an action. When I got up to address my colleagues, she was not the only senator there. If I had used insolent language or foul languages, you know the type of senators we have. They would have reacted, and some of them would have even addressed you guys by now to say Dino insulted us. “But because she acted in the manner she did, not one senator stood up in her defence when I was tongue-lashing her. Even the senators from Lagos were there. Senator Ashafa was there; he didn’t stand up from his seat. Responding to assertions by Senator Ajayi Boroffice, he said: “Unfortunately, this expatriate senator, absentee senator called Senator Borrofice was not even in the chamber, and he has not been in the chamber for the past two months. “He was not in the chamber; I was surprised, maybe, he has celestial powers to understand what happens in his absence. “If there are instances that I am not a super human being, if there are instances where as a human being, I have reacted negatively, I am also ready to be apologetic about it. “I never even used insolent language but because they are yet to heal the wounds of defeat of the election of the Senate President and because of my key role in this exercise, where she and her husband called me severally to appeal to me to back off from Saraki, and I said I would not back off Saraki. “I will continue to speak for those who cannot speak for themselves. I will continue to be a voice for the voiceless and in reaction, I heard that Senator Bola Ahmed Tinubu said my political career has come to an end. I want to say that Tinubu is not God. I fear only the God Almighty; I fear no soul; I only respect souls. He equally dismissed claims that Senate President Bukola Saraki nodded repeatedly to his alleged barbs against Senator Tinubu, saying nothing of such happened.